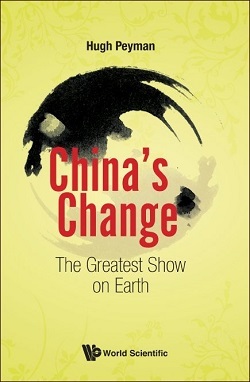 LONDON: Hugh Peyman makes a timely argument about how other countries could learn from the rise of China in his book China’s Change: The Greatest Show on Earth. To absorb the argument fully, however, readers must shelve one premise that has long been part of the China story – the very idea of a one-party state with lack of democratic accountability, embedded in Western thinking as bad governance. Yet, the premise comes with the unresolved contradiction that Beijing’s political system has lifted 700 million out of poverty and created a middle class 250 million strong. Since 1980, China has made a remarkable transformation from impoverished pariah to factory of the world, now moving towards global superpower status. Western leaders have failed to address this paradox, urging voters simultaneously to embrace Chinese investment that improves their lives and to condemn dictatorial practices that throw citizens in prison and suppress speech. China’s Change goes a long way towards clarifying this inconsistency. Peyman argues that China’s success is not about ideology, doctrine or politics, but about process, knowing how to set goals and conceive ideas in a practical way. Two words, yi meaning change and weixin, the idea of constant renewal, lie at the core of Chinese thinking and the ability to plan ahead and reinvent itself. Three times in the last 1,400 years, China has been the lead world economy. China is heading to recapture that slot again, and that is why the arc of Peyman’s thesis goes far beyond Chinese shores. As European and US governments have often attempted to export their democratic systems to other parts of the world, so Peyman asks us to consider how elements of China’s way of planning and accomplishing goals could be used by the West. He paints a picture of a Western democratic system that has lost its way, held back by short-term thinking and conditioned by the electoral cycle. On their campaign trails, Western leaders talk of change and voters appear to want change. But few present a roadmap or playbook to make change happen? Politicians fail to define realistic priorities in a system filled with the same “old stale thinking, simplistic slogans and recycled policies,” as Peyman puts it. With uncertainties created by Donald Trump’s America and the fracturing of Europe’s common vision, Peyman’s point cannot be brushed aside. And there is too much talk of rising authoritarianism to ignore his drilling down into the Chinese system that is defying those once convinced that accountable democracy marked the end-point of societal development. China has become rich and confident. It has built the world’s largest foreign exchange reserves, growing its gross domestic product by well over a 100 percent in the ten years leading to 2016, against America’s 12 percent, the European Union’s 5 percent and Japan’s 3 percent. Far from loosening its political system, the Communist Party’s grip on power is as strong as ever. Peyman has spent most of his working life in Asia, as a journalist, banker and consultant. He witnessed transformation of the Chinese Communist Party, from Marxist-based to capitalist-based. Leaders now embed China’s one-party state institutions with doctrines from the ancient lore of Confucianism, and they are a good fit. Confucius – a statesman from more than two thousand years ago with a long beard, flowing robes, and thoughtful eyes – underpinned his concept of good governance with an emphasis on hierarchy, community, and respect for age, tradition and culture. Confucianism focuses on moderation and compromise. Democracy is not a factor, at least in the Western sense where decisions are made after hearing two sides of an argument that is often loud and combative. By setting politics aside to examine China’s methodology, Peyman might be onto something. One of the more revealing elements, which may be known to China specialists but not to a wider readership, is the level of heated debate conducted within the Chinese leadership, albeit behind closed doors. Deng Xiaoping, founder of economic reform, had to use all the dark arts available to him against hardline Communist Party factions, and Peyman’s account is fascinating. The West dismissed China as a repressive dictatorship, especially after the 1989 violent repression of Tiananmen Square democracy protests. Deng led a fight within the Communist Party to keep his economic reform program alive, but also needed to tread carefully. So, under the guise of taking a family holiday, Deng toured southern China, the economic engine of his program, gaining enough political impetus for his will to prevail. Similar debate on President Xi Jinping’s hard-driving policies is likely take place now within the leadership, whether on anti-corruption, the “re-education” internment of Muslim Uighurs in Xinjiang or the speed of the expansion of Chinese power abroad. Such inside debate has become all the more pivotal since the United States has stepped up its antagonism against China, branding it, among other things, an unparalleled surveillance state. China’s Change does not cover the current ups and downs of debate within the Chinese Communist Party surrounding Xi Jinping. Instead it offers a long view with skillful insight into how the government of this massive country thinks, what it plans to achieve, and how it differs from the Western mindset. In short, a US president is working to the next day’s news cycle, whereas a Chinese one is laying out roadmaps to 2050 and beyond. Critics at home and around the world challenge the US president on every announcement while the Chinese president, in public at least, stands almost unchallenged on how he uses his power. These two systems are currently going head to head. Throughout China’s Change the question swirling around democracy remains the elephant in the room, essentially how much individual freedom should a society forfeit in order to make the rapid advances achieved by China. Had Peyman focused on this, China’s Change would risk becoming another on the pile of books about authoritarianism and the world order. Instead, he explains the inner workings of the world’s most ambitious authoritarian system and leaves for readers to decide which elements, if any, the foundering West should borrow to help lift itself out of its current confusion. Humphrey Hawksley is an Asia specialist. His latest book is Asian Waters: The Struggle Over the South China Sea and the Strategy of Chinese Expansion. Correction: A quotation from China’s Change was garbled and now reads: "Clearly a fan, he writes: 'I have watched five Confucian-based societies in Japan, South Korea, Taiwan, Hong Kong and Singapore become first world economies. The home of Confucianism is now the greatest show on Earth.'"